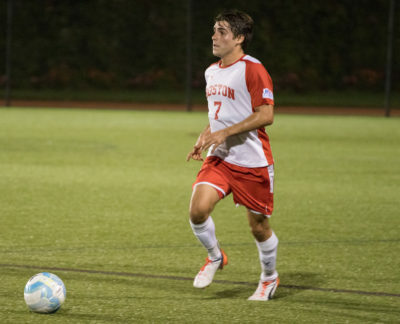 The Boston University men’s soccer team (7-7-2, 6-1 Patriot League) started this season’s final three-game stretch Wednesday night against the United States Military Academy in West Point, New York. The Terriers continued their Patriot League dominance, posting a 3-1 victory against the Black Knights (8-6-1, 2-4-1 Patriot League). The game started with 20 minutes of back-and-forth action, as both teams came out of the gate looking to put pressure on each other’s defense. Army was able to draw a free kick just outside of BU’s box at the 15th minute, but the potential danger was handily dealt with by the Terriers’ defense. The Terriers quickly pushed back against the Black Knights in the 22nd minute, by winning the ball in their own third, which eventually led to a breakaway scoring opportunity for freshman back Elias Lampis. Army’s senior goalkeeper Christian Nolasco came out and saved Lampis’ shot attempt, but the rebound allowed BU sophomore midfielder Satchel Cortet to bury his shot past Nolasco, putting BU up 1-0 midway through the first half. The Black Knights responded with even more pressure and aggression after giving up a goal. At the 24th minute, Army pushed down the middle and forced Terrier freshman midfielder Peter Kargbo to take a foul who received a yellow card in the process. However, BU doubled down. At the 33rd minute, the Terriers built up an attack down the middle then quickly moved the ball down the right side of the field. A cross from freshman midfielder Toti Knutsson was then headed home by fellow freshman forward Austin D’Anna, giving the Terriers a 2-0 lead. Knutsson has been hot over the past two games, coming up with a game-winning goal against the United States Naval Academy over the weekend and a lead-expanding assist against the Black Knights. For the rest of the half, BU’s defense was able to handle Army’s offensive onslaughts to keep their team up 2-0. The Black Knights finished the night outshooting the Terriers 9-8. The second half started with an elongated stalemate, with only one shot taken between the two teams for the first 25 minutes. As the game drew closer and closer to an Army defeat, the Black Knights started to pick up the pressure yet again, but the Terriers tucked their formation into a defensive set. BU continued to push forward with possession when opportunities presented itself, but focused on defending their lead for the most part. Unfortunately, the Terriers’ first goal-scorer Cortet sustained a right leg injury in a collision in the 83rd minute and was helped off the field by a trainer. The collision set up a free kick for Army, and they used it to throw a few shots at sophomore goalkeeper Michael Bernardi. Bernardi was able to save them and even got some help from one of the goalposts. The Black Knights kept the pressure up and finally found their response to BU’s two goals, when forward Rex Epps found the back of the net in the 83rd minute. Although the Terriers came back with a dagger. In the 84th minute, D’Anna netted his second goal of the game, off of a quick assist from junior midfielder T.J. Butzke. Even with the 3-1 lead, BU kept the pressure up until the end and closed out the win. The Terriers will take their now 6-1 Patriot League record up to Bucknell University on Saturday. “It was an overall good performance in a difficult place to win,” Roberts said.